JusWondering… How Should We End This Movie? With A Dance! I just finished watching Gnomeo & Juliet (it’s a new release on Netflix streaming and I was just testing out my new Blu-Ray player and I picked this and I ended up sticking to it no excuses… it was highly entertaining and pun-derful), but something about the ending bothered me. It ended with a stupid dance scene. I don’t know where the idea for this cop out ending began, but the last time I noticed it was during the end of Despicable Me (I watched this one on a long flight to Prague no excuses). This was the first dance scene that really bothered me because it seemed to be an answer to the question posted above – how should we end this movie? But hey! 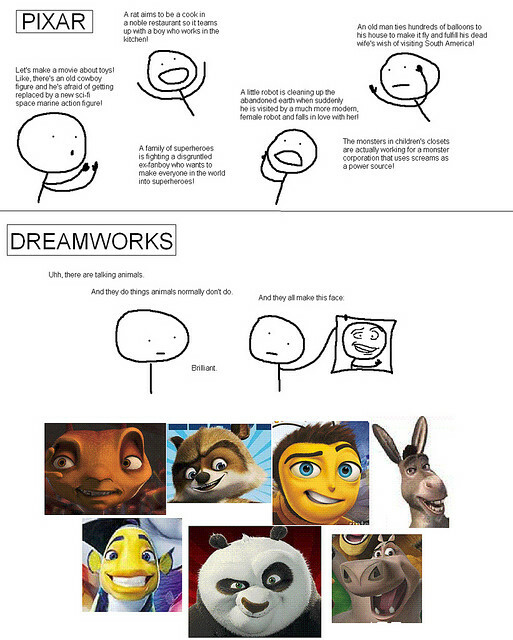 Those are all Dreamworks films! That’s like picking on them for their Dreamworks faces! Musical Musings… What Does “That” Mean?